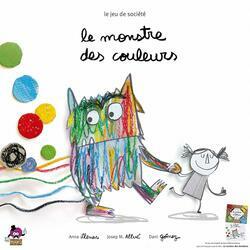 The Colour Monster players work together to help the Monster understand his emotions. In turn, they roll the die that allows them to move the Monster around the board. When the Monster goes into a space with an emotional token, the player can pick it up and look for the right pot. The pots are all placed on shelves with their hidden colours. If the player chooses the pot that corresponds to the color of the emotion, he can then place the emotion chip in the pot. Otherwise, the pot returns as it is to the shelf. To pick up an emotion token, players must explain a memory or situation in which they feel like the emotion they are picking up (Happiness, Sadness, Anger, Fear or Calm). Players can lose the game if the monster gets too confused and they return too many jars of mixed emotions, or win the game when the emotions are all placed in their respective pots. Contents of the box : 1 Game board, 1 Monster of colors pawn, 1 Little girl pawn, 1 die, 8 jars to store emotions, 2 shelves for jars, 5 tokens for each of the emotions, the rules.